In order to get “warmed up” for writing this morning, I looked at the outline for the chapter and made a few notes while I was (silently) drinking my coffee early this morning. I usually spend this time looking at the news, and this was definitely a more peaceful start to the day. I need to get a few random thoughts down before I can actually start writing in complete sentences. I eventually wrote for about 30 minutes. I now have about two pages of writing interspersed with lists to turn into sentences, things to look up when I am not writing, and some ideas for figures, photos and tables. It is a start. What works for you? What rituals do you go through before you start writing? My son is off in grad school, so mornings can be pretty peaceful around my house. How are you finding writing time if you have kids at home, a dog demanding a walk or a cat wanting to lie across your keyboard? Let us know how you’re doing! Lindsay will check in tomorrow and I’ll be back on Day #3. 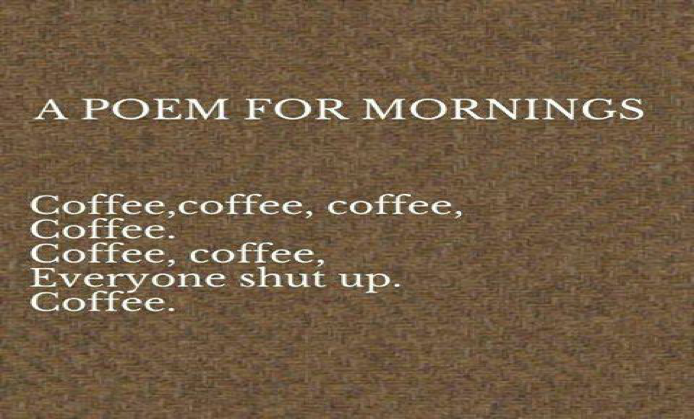 I love the coffee poem. I need to put that on the door to my home office! My favorite writing ritual is to get up early in the morning, pour myself a piping hot cup of coffee and go sit outside to sit on my back porch. I can see the mountains from there. The view plus the cool morning air makes for a lovely, grounded writing space.